Ivy Dickens wears a beautiful neutral-coloured outfit on this week’s episode of Gossip Girl, Con Heir. In this spring/summer season, we aren’t all living in humid and hot weather. For those days, tights or stockings, like the one worn by Ivy, are a great way to keep you warm. Ivy rocks the McQ Alexander McQueen Belted Coat. She pairs it with her Riki Rosetta Anastasia Large Ostrich Satchel. It’s starting to look like Ivy is becoming an official Upper East Sider! Woo Hoo! — Well at least for the fashion side of things; not for the van der Woodsens! Ivy Dickens gets all glamed up for her charity benefit in a sparkly and copper-toned dress. (Perhaps to resemble her new found wealth?) She pairs that with some killer embellished black heels from Zara. This is Ivy’s Vera Wang Lavender Lace Sleeve Lace Dress. She also wears the Zara Jeweled Slingbacks. Ivy Dickens my not officially be a Rhodes, but she sure knows how to dress like one! Ivy returns to the Upper East Side in this weeks episode of Gossip Girl, Crazy, Cupid Love. Ivy’s style is surly more classic than the ones of the other characters. She arrives in a green ensemble consisting of the Gryphon Fall 2011 ‘Timeless’ Coat. 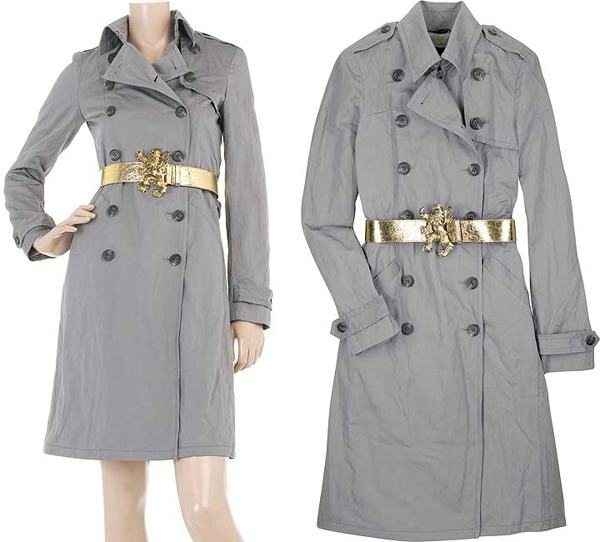 I personally love trench coats because they are completely classic and is one of the only outerwear that gives a very defined waistline. This is what creates the hourglass figure. This is Ivy’s Gryphon Fall 2011 ‘Timeless’ Coat. She has it in green.